Not a bad machine at all, especially when you consider the current Mac Mini costs $699 and is stuck on a boring old Core 2 Duo CPU with 2GB of RAM and a 320GB drive. Lifehacker borrowed the infamous TonyMacX86 walkthroughs and updated it slightly into a single page of easy to follow instructions, they even included a video (embedded below) showing exactly what to do in the BIOS which makes it even simpler. Oddly enough the guide was published just weeks before Mac OS X Lion arrives, so you’ll probably have to tweak a few things in the near future if you want to run Lion on the machine. Nonetheless, TonyMacX86 is usually on top of all this stuff pretty quick, so you can almost certainly bet that Lion will run on the machines. 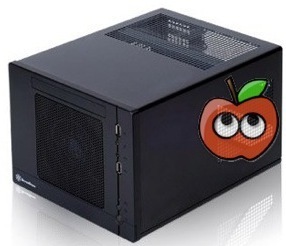 If you’re going to be building a PC in the near future anyway, why not build one that is Hackintosh compatible? Add it onto your list of geeky Apple things to do this next weekend. Same here. The other thing that Lifehacker fails to mention is that you still need to buy a screen for that Hackintosh. Let’s say a good 22″ screen is $250, so you’re now at $850 and you still have a loud ugly PC box under your desk. What if you want a Core i5 processor? You’ll be out another $100, so now you’re at $950. Guess what you get for just a little bit more at $1200? A brand new iMac with a Core i5 CPU, beautiful all-in-one enclosure, high res 21″ screen, a year warranty, and guaranteed Lion support. Price it out against a real Mac and not the outdated Mac Mini, these Hackintosh’s just are not good deals anymore. Most people don’t want an imac due to the all in one nature and the fact you can’t upgrade the components. Nor do most people mind a box under the desk. Because it’s under the desk and you can’t see it so it doesn’t matter. I’m typing this on my 27″ imac now. But I also have many PC’s here and they have lasted a very long time as I can just swap out whatever component I need to when I need to. Then you should see my imac. I had to add a USB hub so between the imac, the keyboard and the ports on the hub I have 12 USB ports and i’m currently using all but 2. The imac desktop doesn’t look any cleaner than my desktop PC. But that’s not to say either look very cluttered. The hub and most USB connections are under the desk and out of sight. Not to mention a real desktop video card. Though the 6970m 2gb in the new imac is decent for now. Oh and soon I need to add an external firewire enclosure for my bluray reader for the imac so I can continue to make my rips. This build has added costs because it uses a fairly expensive ITX case rather than a more standard one, a more expensive slim DVD-RW drive, ITX motherboard, and SATA adapter. Build a more standard ATX or mATX tower and you’re spending less and getting more bang for the buck. With this build, you pay for the smaller size. I’ve machines of this type and they are not loud- that’s just you adding on your own hype to the pile. Clearly, someone this would appeal to isn’t interested in an iMac- they’d probably rather get a mini. (Lots of people hate the all-in-one form factor, me included). So someone would be buying a monitor for the mini also. The Mac’s real advantage would be guaranteed Lion support. I’m not sure anyone knows yet just how well retail Lion will run on a Hackintosh. Time will tell. 6 years, I am using iMac, never been serviced. Your analogy is completly bad, if IMac monitor dies only have to replace the monitor and not the whole IMac:) on the other hand, Pc comes out of the more expensive if you buy the same quality monitor as IMac have. It costs a fortune to replace the LCD panel in an imac by apple if it’s not under warranty. You could do it yourself if you aren’t afraid of opening it up and can pick up a panel off of ebay but the cost is still high and most people aren’t comfortable with doing that. They’d likely toss it out and get a new computer. With the same quality monitor I can still build a more powerful PC for less than this imac i’m typing on now. Though the majority of people don’t need or care about a $900+ monitor. I can get 3 good quality monitors for that price, though not IPS displays but still nice and LED backlit and have a nice eyefinity setup. Mac Pros are workstation machines and not suited for the general consumer. One could still use it though. You just need apple video cards unless you are comfortable with flashing some hacked firmware onto a PC video card. Though AMD cards should start working on mac or PC without flashing, don’t know if those are out yet. Still when you need more video power you buy a computer, when PC users need more video power they buy a video card. It’s more or less be said, but I’ll say it too; for an extra $200 – you get something smaller and faster (Hackintosh’s are always slower – even with a fast CPU and lots of RAM). The other problem you’ll have – “no Lion for you”. Well, not until all the hacks come out… and then you get to jump through all these hoops again. I am typing on my Hackintosh running Lion D3 with dual QuadCore Xeon’s 32gb ram and a 5670 ATI and I can assure you it”s no slouch. This Hackintosh would not even skip a beat running with the top of the line MacPro, so don’t spread BS about Hackintosh’s being slow. Such FUD. The exact opposite is of course true. Hacks are consistantly faster than Apple’s offerings, unless you get a MacPro. People that are even halfway tech-saavy can easily maintain an OSX install on a Hack- it was easy with Leopard, easy with Snow Leopard, and will probably be easy with Lion. It’s not for everyone though. Apple’s iScriptKiddies need not apply. Thats not a Hackintrash Mini, thats a normal sized computer in a different shape that happens to illegally have OSX installed..
With your Mac Mini, please tell me how you install PCI cards. I want USB3, because nothing uses Thunderbolt and DVI out, possibly HDMI. I would also like to install an i7 intel chip and add at least 8GB of physical memory. I want nothing to do with virtual memory, as this is a trick used on low-class computers to give them a boost. Before you make up condescending words such as Hackintrash, back it up. Are you suggesting I buy a Mac Pro with these specs for $2600? I’ve been using Apple products since 1980, don’t tell me I don’t know what I’m doing.What I really don’t like are pretentious wanna-be-fan bois that have no technical background acting like they do. Your’re right that’s not a mac-mini, with these specs it is closer to a pro. To top that it is upgradable. ANSWER ME ZEDD. I double-dog dare ya. You tech ignorant loudmouth. ps. External cards are not acceptable, as they are connected by USB 2. So old for technology, but the best Mac has to offer. I also require digital audio out, or optical for 5.1 sound. I need an internal Graphics card also. Well, i was short-off getting a new iMac – if there wasn’t the glare Display. Also, on my current setup i have a beautiful, PA271w connected to a 17″ (non-glare) Book. The Display uses – afaik – the same IPS Panel like the iMac does but is non-glare and is has way better driven than the iMac`s is. Watching the iMac again and again i now decided that it`s simply not an option to place it next to it. For now, i`m hopefully fine with the Book for some more months (more thang 8G of ram would help ..) and then i`ll think about an high-performance (I7, 16G+ of RAM) Hackintosh with 2 Dual-Link capable Videocards and get another PA271w to keep my workspace consistent and treat my eyes with care when working. This is a great article. For those dissing the cost, stop comparing it to a mac mini, with a core2duo; and compare it with a low end mac pro. Want to spend a little extra for 8GB DDR3 and an i7 chip expect to spend $300-400 more. I have many extra displays lying around. And since they are getting cheaper, I’m, always looking for an upgrade. The ability to add PCI cards is indispensable. But it will still be an unreliable hack… Why not just use Linux if you want a semi-stable environment? The hackintosh price leaves off the cost of a legal copy MacOSX. If you’re a thief this won’t matter, but then why even pay for the computer? Just steal a whole Mac. Clearly you didn’t read the article. It includes Snow Leopard for $30. The best thing about the Hackintosh is it makes Apple fanbois lose their minds and start spreading the most obvious FUD. I think it’s just the fear of realizing that their Mac isn’t all that special since the tech saavy can build their own OSX system of whatever spec for less. Exactly the opposite of Apple’s “Do ONLY as we say and pay through the nose for it” approach. Get over it.